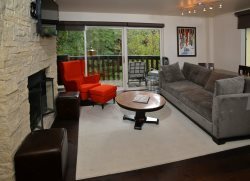 Private condominium tucked at the base of the slopes and in the heart of Vail offering gorgeous mountain views. Just a short walk to the ski lifts, shops, restaurants and The Ford Amphitheatre. Hotel-style amenities but with the cozy and unique mountain feel of a private residence. This brand new 3 bedroom/3.5 bath residence is a gorgeous home away from home. This condo has three large bedrooms (2 rooms with king bedding and 1 with twins), spacious living area with a fire place, flat screen tv and a gourmet kitchen. Enjoy incredible views of Golden Peak from your private patio.